Download a copy of CAL FIRE’s Defensible Space flyer for a graphic explaining the most important concepts of defensible space. 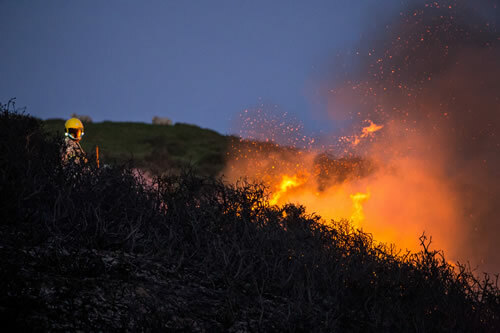 Creating and maintaining defensible space around your home and outbuildings, before fire-prone summer months, is imperative in avoiding major damages to your property when wildfire strikes. Defensible space is the buffer you create between buildings and the vegetation that surrounds them to prevent structures from catching fire, either from direct flame contact or radiant heat. Creating ample buffer zones not only increases the chances of your home surviving a fire on its own, but it also gives firefighters a safer location from which to defend your home. In fact, fire crews are more likely to spend time defending your property if you have taken steps to limit fuel loads around your buildings. Creating defensible space around your home does not mean you need a ring of bare dirt surrounding your property; with proper planning, you can have a fire safe home and a beautiful landscape. The general concept is that trees should be kept farthest from the house, shrubs can be closer, and lawns and bedding plants can be the closest. If your landscaping has a different configuration than this, you can improve defensibility by keeping larger trees limbed up and shrubs free of dead, dry material. California State law requires that you maintain 100’ of defensible space around your home and outbuildings. Two zones, the home defense zone and the reduced fuel zone, comprise these 100’. If your home is built on a steep slope or subject to high wind exposure, this buffer zone should be increased. The home defense zone extends 30’ out from buildings, structures, decks, etc. Remove or mow all dead plants, grass, or weeds. Remove dead or dry leaves and needles from yard, roof, and gutters. Trim trees regularly and maintain a minimum of 10’ between canopies. Remove branches that overhang your roof and any dead branches close to chimney. Relocate woodpiles to Zone 2. Remove flammable items and plants from around and under decks and along structure walls. The reduced fuel zone extends beyond the home defense zone and extends to at least 100’ from the house or to your property line. Cut or mow annual grass down to a maximum height of 4”. Create vertical space between grass, shrubs, and trees. Remove dead or dry leaves, needles, twigs, bark, cones, and branches from ground. Note: Check with your local fire department for any additional defensible space or weed abatement ordinances, as some locations require increased clearance zones.